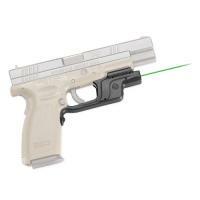 Crimson Trace LG-453 LG-453 Green Laserguard for Springfield XD and XDM FREE SHIPPING! Crimson Trace has been an industry leader in Lasergrips® and Laserguard® items for over 20 years, engineering premium products that exceed military-grade standards. The LG-453 packs innovation and performance in its compact, polymer body. The optimized, bright green Laserguard® platform provides maximum visibility (more receptive to the human eye than any other laser hue) for a range up to 50 feet, ensuring unparalleled aim accuracy in all lighting conditions. Adjust the LG-453 to accommodate for elevation and windage. Switch on your laser using its front pressure activation, or use the master power on/off switch for complete unit deactivation. The LG-453 incorporates Crimson Trace's signature Instinctive Activation™ technology, providing automatic engagement of the laser on the draw--a feature unmatched in the market. With the powerful CR2 lithium battery, users are guaranteed an impressive two-hour run time. Leaving the profile of your firearm unaltered, you can effortlessly install the Laserguard® onto your Springfield Armory XD and XD(M) firearms. The Crimson Trace name is a revolutionary companion piece to any firearm. ©2002-2019 CopsPlus.com: Crimson Trace LG-453 LG-453 Green Laserguard for Springfield XD and XDM FREE SHIPPING!